Alternative Voting – Hatfield's last best hope? On Thursday, 5 May 2011, the country goes to the polls for the local elections and a historic referendum on whether to change the existing First Past the Post (FPTP) system to an Alternative Voting system, which is closer to the more representative Proportional Representation. 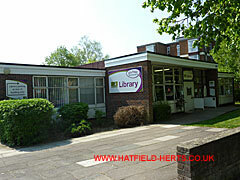 Due to the current electoral set up Hatfield has been at a serious disadvantage, and the spending figures alone show it is being treated as very much the poorer relation. AV represents an opportunity to shift the balance of power to ensure Hatfield gets a Fair deal – and not a raw one, as has usually been the case. 07.05.11: Results for Welwyn Hatfield were 23,482 against; 8,876 in favour. Turn out in Hatfield wards particularly was very low (30-40 per cent). The Alternative Vote was also rejected at a national level by a substantial margin. Hatfield is still seen as a horrid, little chavtown? The redevelopment of Hatfield town centre has been stalled for years yet supermarket groups are falling over themselves to invest in Welwyn Garden City? So little has been done to celebrate Hatfield's incredible history? A town with a great location, excellent transport links and close to both London and Cambridge, and Stansted and Luton airports, ended up in the rather pitiful state it's in today? Some argue it is all simply down to the creation of Hatfield 'New Town' after WWII – a time when there was a shortage of cash, building materials and an urgent need to rehouse people bombed out during the war, and disperse the population (due to the Cold War) – set against Welwyn Garden City, a well-planned urban idyll built when the Britain was at the height of her imperial power. The author is of the opinion that while the well laid out, landscaped garden city with generally better quality and more spacious housing has its advantages the answer isn't that simple. 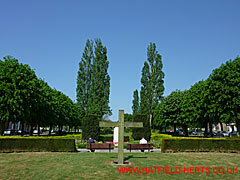 A view of Park Way, Welwyn Garden City – avenues of trees and well tended gardens (and the Coronation fountain beyond). 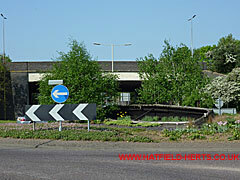 A key factor in Hatfield's decline appears to be the fateful merger of the administrations of Welwyn Garden City and Hatfield back in the early 1970's to create a larger area which would be cheaper to run. Only Labour and the Conservatives have held power in WHBC and neither appear to have done much good for Hatfield. If anything, quite the reverse. Unfortunately, as it exists today, Welwyn Hatfield Borough Council, leaves Hatfield outnumbered – the five Hatfield wards return 14 councillors vs. 7 WGC wards returning 21 councillors (add historic Welwyn, and it becomes 9 wards returning 26 councillors) and that is making the assumption that all of Hatfield's elected representatives stand up for Hatfield – and not put their own political careers and party loyalties first. Unfortunately, there is little sign of that assumption being borne out so Hatfield is even more disadvantaged electorally. 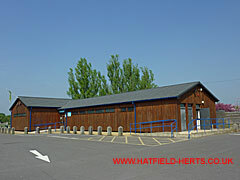 With the council leadership based in WGC, it seems that Hatfield is out of sight and out of mind. Even worse there appears to be a systematic exploitation of Hatfield mainly for the benefit of the Conservative-controlled heartlands in WGC and elsewhere in the Welwyn Hatfield district, and county. Labour rule resulted in financial disaster with The Galleria, and a broken promise to build a major hospital in Hatfield (cancelled as an act of spite – according to the Conservative MP who beat their candidate at the last elections). Ironically, the Conservatives then rewarded Hatfield for electing their candidate by confirming proposals to build a massive waste incinerator in South Hatfield (an electoral ward which returned a Labour candidate, so it would appear Labour aren't alone in possessing an alleged vindictive streak). Interesting also to note, in the Conservative-controlled, Hertfordshire County Council's Waste Strategy consultation documents – drawn up with input from local district and borough councils – that of the four sites nominated in Welwyn Hatfield District, three were in Hatfield ie. if there was going to be a waste facility in the borough there was a 75 per cent chance of it ending up in Hatfield from the start. However, as an incinerator will have a negative impact not only across the whole of Hatfield but also on neighbouring WGC, St Albans, Welham Green and Brookmans Park it seems a bit of an overkill. Although Hatfield property prices are likely to be worst affected – and it will put off prospective investors and professional people, making the long-delayed Hatfield town centre redevelopment an even more remote prospect. Adding insult to potentially toxic injuries, were the initial plans to clear the New Barnfield site in Hatfield in anticipation of the incinerator coming there (even though officially the process was still at the consultation phase). These would have seen the last chance school for disruptive youngsters being expanded and moved to a central location on Briars Lane in Hatfield, while the Central Resources Library (the main repository for HCC's Library Service) is to be moved to a brand new, purpose-built site in Welwyn Garden City. 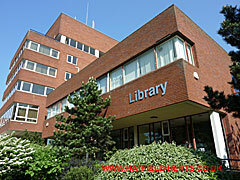 The Central Resources Library also houses a business enquiry service and a music collection. So far, no one has been able to provide an adequate explanation as to why the CRL should be moved to WGC, which already has two public libraries. Especially, as Hatfield is home to the University of Hertfordshire (with a far larger student body than Smallford College, and is also closer to the Royal Veterinary College at Welham Green), Business Link, and the UH Philharmonic Orchestra. Plus, there are savings to be made by merging it with the small library in Hatfield town centre – which is facing restricted hours due to budget cuts. Nor is there a sensible answer to the question: if the funds are available to build a new library then why isn't it being used to help kick-start the Hatfield town centre redevelopment and build it in Hatfield? Apart from rents and council tax income, WHBC receives money from central government to make up for an expected shortfall in Council tax due to the large number of student houses in Hatfield, it also receives money (including some from other councils) for housing people from outside the borough in its accommodation. Yet there seems to be little sign of this money being spent in Hatfield. In fact, a brief examination of WHBC's annual report and accounts over the last few years alone show a shocking inequality in spending between Hatfield and WGC. Between 2003-09 WHBC Capital Commitments (basically large spending projects mentioned in their accounts) show over £7.1m spent on improvements in WGC with a paltry £0.28m spent on Hatfield. Add over £1 million given in various forms to Gosling Sports Park (please see below for details) and that becomes over £8.1m vs. £0.28m. This does not include £20k spent on placing an old boat on the roundabout by Stanborough Lakes as a public artwork (below). Indeed, it would probably need a forensic accountant to work out the true total. The boat was installed with the idea of making the entrance to WGC more imposing. Plans to extend the 'boat' scheme to 12 WGC roundabouts at a cost of £240k were announced but so far have not gone ahead. WGC supporters like to say that only Hatfield has a swimming pool, however they are conveniently ignoring that among the many facilities at Gosling Sports Park is a 17m spa pool. 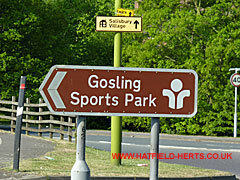 Officially, Gosling Sports Park is a charity; however, it has very close links to Welwyn Hatfield Borough Council. As far as the author is aware, it has always had one or more WGC councillors on its board. Additionally, it has received substantial financial assistance from WHBC. Since 2000, while Hatfield town centre has continued to deteriorate, Gosling has received over £1 million in grants, loans and rate relief from WHBC. July 2002: £300,000 grant towards the running track. 2009/10: £250,000 (10-year loan towards outdoor facilities). Perhaps of greatest concern to Hatfield residents is that WHBC links and support for Gosling Sports Park make it unlikely that there will be a football grounds and stadium built at Angerland – or anywhere elsewhere – in Hatfield. Our local authorities, it seems, are happy for Hatfield residents to have to travel to facilities located in WGC and pay for the privilege – in effect, a further subsidy, and tax on the people of Hatfield. 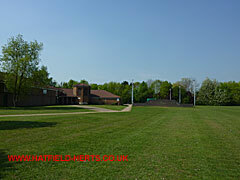 Community Pavilion at King George V Playing Grounds, WGC. Other facilities include 2 bowling lawns, 8 football pitches, 8 floodlit tennis courts, 2 basketball courts, 5 netball courts, 2 cricket pitches, pavilion and changing rooms and a skateboard park. This is a WHBC facility. Moneyhole Lane Park, Panshanger, WGC – visible in the distance is the pavilion used by Panshanger Football Club, floodlit tennis court, basketball and street snooker court. Not shown are the football pitches, rugby mini-pitch, and children's play area (which includes a massive rope climbing frame). This is also a WHBC facility.